Impress your friends with a Jumbo Plush Snake or a Huge Stuffed Alligator or Big Plush Toy Frog. We have a big selection of Giant Stuffed Snakes, Alligators and other Large Stuffed Reptiles to choose from. Move over mate, time for the big boys to come through. This section features only our jumbo and giant sized stuffed snakes, alligators, frogs, lizards and other big stuffed reptiles. These large stuffed reptiles and frogs are huge and cuddly and waiting for someone to catch them and bring ’em home. Steve Irwin would be proud of our huge stuffed crocs and our big stuffed alligators. We also have some impressive giant stuffed anaconda snakes and huge plush toy python snakes that are almost ten feet long! These jumbo plush snakes are sure to be a big hit at any party or in any bedroom. Our giant plush python and anaconda snakes are some of the largest stuffed animal snakes you will find anywhere. 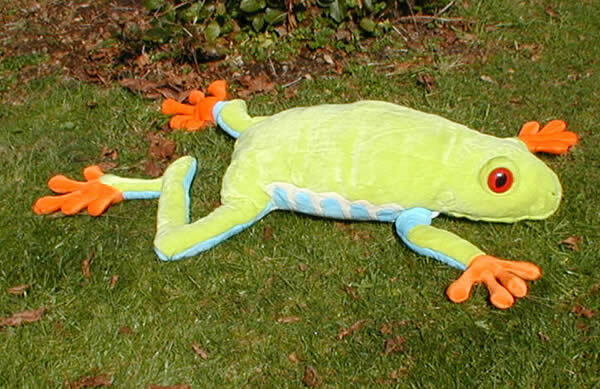 And don’t forget about the large stuffed frogs that we have. Grandma Lily is a giant jumbo stuffed frog that is adorable and very cuddly. She is probaby the biggest plush frog you will find anywhere. So put on your jungle boots and gear and lets go catch some big stuffed crocs, alligators and anaconda snakes.